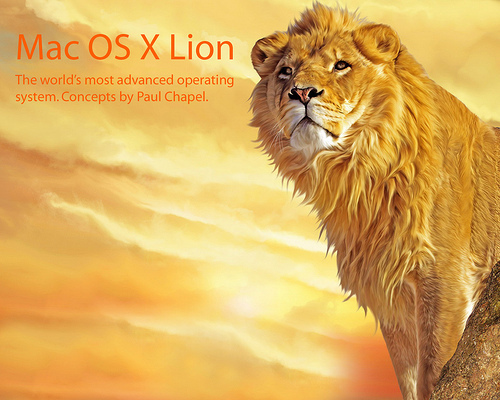 In the latest release of Mac OS X 10.7 Lion some new features are going to be added. Some features available on the iPad will also be integrated into Mac OS X Lion. Some of these features include the Mac App Store, Launchpad, Full-screen apps and mission control. These new features will allow Mac OS X Lion to function more like the iPad. Also included are new multitouch gestures. These gestures have also been added to the Magic Mouse and Magic Trackpad for desktop systems. in Mac OS X 10.7 Lion one of the new features will be the Mac App Store. This feature was only seen on the iPhone and iPad previously. Now it will be integrated into Mac OS X Lion. The Mac App Store will allow you to purchase various application directly and have them downloaded immediately. Only Apple approved apps are available through the Mac Apple Store. According to Steve Jobs, Mac OS X Lion will not be restricted to only apps purchased from the Mac App store but it will be the best place to get them. A couple new features include Launchpad and full-screen apps. Launchpad will be a new way to search for and run installed applications in Mac OS X Lion. The icons will be listed on a SpringBoard like grid with multiple pages available. When open an app some of them will incorporate a full-screen view option. This new feature is an option that is now available to developers to include in their apps. When the full-screen option is used the toolbar on top will disappear. One more feature for managing running apps is called Mission Control. Mission Control is a new feature that organizes all running apps and will display them in one location. Windowed apps, full-screen apps, Exposé and Spaces are all combined into one window. This new feature simplifies how you can manage all open applications. Instead of having to open multiple windows, all running apps are in one window. Various gestures have also been implemented for Mission Control as well. One more new feature that will be included in Mac OS X Lion would be new multitouch gestures. These gestures were previously only available on the iPad. Now they will be availaible in Mac OS X Lion as well. Also regarding multitouch gestures is that they will also be added to the Magic Mouse and Magic Trackpad. The desktop systems will now also be able to benefit from multitouch gestures as well.